With 2015 almost in the bag this is a good time to sit back and review your investment performance for the year. For me there are a few things I’m most interested in checking: 1) Total returns, 2) dividend yield and 3) what I learned this year that may help improve my approach and returns in the future. The model portfolio went from £71,358 at the start of the 2015 to £81,551 at the end, for a total return of 14.3%. This is significantly better than the All-Share tracker benchmark, which went from £67,498 to £68,050, a total return of 0.8%. Outperforming the market by 13.5% is the portfolio’s best one-year result relative to the market so far, so I am of course very pleased with that. It beats the previous record, where it outperformed the market by 6.5% in 2012, by a country mile. However, although I am pleased to have thoroughly beaten the market in 2015 I am well aware that this degree of outperformance is very unlikely to continue. More realistically, I would like to beat the market by about 3% (at least) over the long-term, so let’s have a look at how the long-term returns are going. Since I started managing and tracking these portfolios in early 2011, the model portfolio has, at least most of the time, achieved my goal of beating the market by 3% over the long-term. With a 10.7% annualised return compared to 6.6% for the UK market, the rate of outperformance has been 4.1%. I’m happy with that, although of course I realise that the past is not always a good guide to the future! Having said that, as the years roll by I am gradually becoming more confident that my strategy and the defensive value approach in general are likely to outperform the market under most circumstances. Here’s a chart of the returns to date. That’s the total return picture, but I am just as interested in dividend growth and the dividend yield as I am in capital gains, so let’s have a look at those. 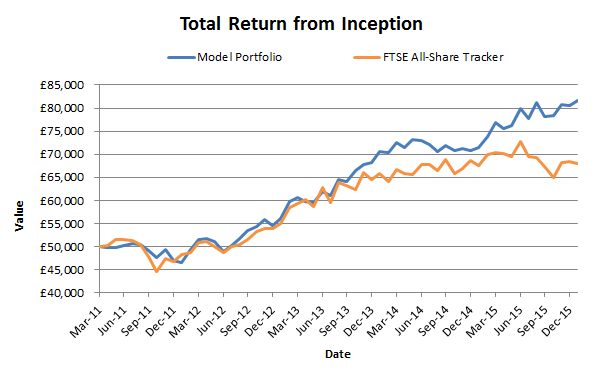 One of my goals is to have the model portfolio produce a higher yield than the FTSE All-Share at all times. So far it has achieved this every day since 2011, and it currently has a 4% yield compared to 3.5% for the All-Share. To be considered as an equity income fund, a unit trust must have a yield of 110% of the All-Share’s yield, or 3.85% today, so the portfolio makes the grade on that basis too. 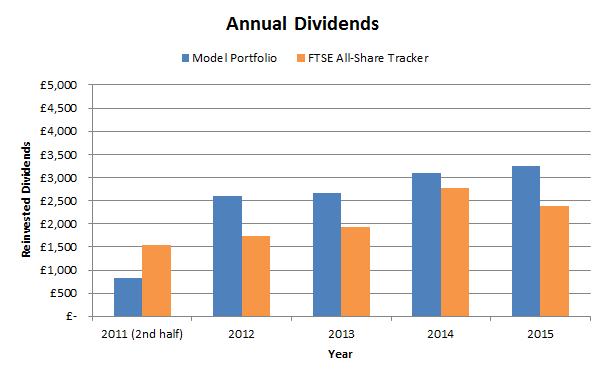 Given that the model portfolio is worth more than the FTSE All-Share and that it has a higher yield as well, it should be no surprise that it has produced far more in dividends this year; 36% more to be precise. This comparison is somewhat confused by changes to the dividend payment dates of the benchmark investment trust, but I think the comparison is broadly representative of the underlying (rather than market) value of the two portfolio’s holdings. The chart below shows the dividends paid in each individual year. In terms of raw performance then, I am more than happy with 2015. However, it wasn’t all plain sailing and there were some problems through the year that needed to be addressed and learned from. No portfolio goes up in a straight line (unless your name is Bernie Madoff) and few equity investors will get through a year without suffering share price declines or operational problems with some of their holdings, and I am no different. 2015 was the first year in which I sold an investment at a loss since I switched from deep value to defensive value back at the beginning of 2011. It was not a pleasant experience, but so far it has not been a frequent one either. Here then are all of the investments I sold in 2015, along with their results, lessons learned and a link to each post-sale review article, so that you can save yourself some trouble by learning from my mistakes. February ICAP 2 years 10 months 42% None. This was a successful investment. April Balfour Beatty 3 years 8 months 9% Be wary of companies that rely on large one-off contracts. Be wary of companies with large pension liabilities. June Serco 1 year 1 month -50% Be wary of companies that rely on large one-off contracts. Be wary of companies that have made large acquisitions. August RSA Insurance Group 3 years 6 months 19% For insurance companies, look at the combined ratio for profitability and the premium to surplus ratio for balance sheet strength. October Cranswick 2 years 11 months 135% None. This was another successful investment. December JD Sports 4 years 9 months 234% None. The investment went as well as I could ever expect. Overall I would say I have enjoyed investing in 2015, despite a bit of a rough patch in the middle of the year thanks to weak performances from Serco, Balfour Beatty and RSA. Hopefully your results have been even better than mine, but either way let’s hope for a positive 2016 in both the stock market and beyond. 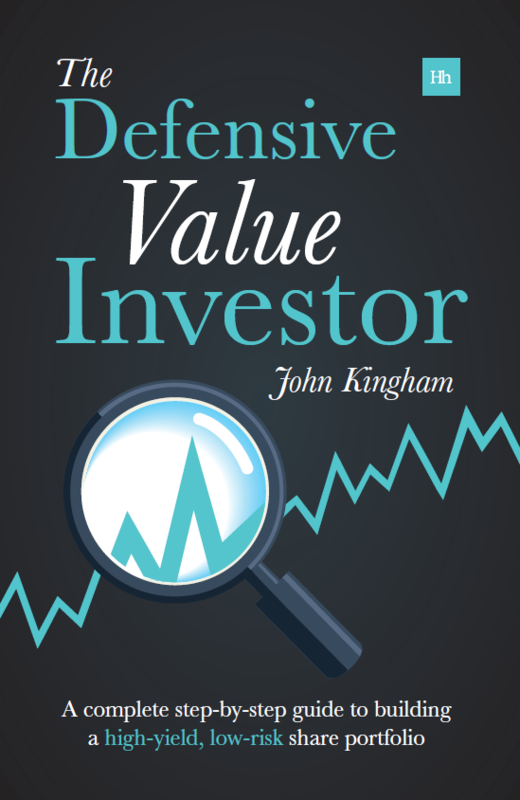 Excellent work here John and interesting how you changed from deep value to defensive value to make it work. Could you provide a few links to posts you may have written about the switch from deep value as I’d like to take a gander. You should open your own investment partnership with these results! Hi David, thanks. Going from publishing a newsletter to managing other people’s money is a big step. I have looked into it a couple of times but the barriers to entry (required assets under management, etc) are quite large. So I would say don’t hold your breath on this one! As for some links, I’ve had a look at the archive and found a few that are sort of relevant. The first three relate to a period where I started to look at return on equity in addition to the the PE and PB ratios (it was sort of a Graham net-net approach). I also moved from holding 10 companies to 20 and started my one-trade-per-month rule that I still follow. I soon realised that was a mistake and, having recently read and liked The New Buffettology, I moved much more in Buffett’s direction and started looking for consistent profits, dividends, low debt, good profitability, etc, over a 10-year period, which is the core of what I do now. And the following five years have been a refinement of that approach. Thanks for these John they make very interesting reading and make complete sense. I’m actually looking at buying into stocks monthly also and your articles have helped in this regard. Thank you for sharing all this knowledge John, much appreciated! Congratulations John – this is an excellent result. Have you done a returns attribution analysis? Roughly what proportion of your returns came from e.g. JD Sports? c) I’m not sure if such an analysis would have any value. However, since you mention JD, and that was by far the biggest contributor of the year, I have crunched the numbers. The portfolio gained £10,193 in 2015 and JD, with a position size of 5% at the start of the year, gained £2,544 (including rebalancing/profit-taking by selling half of the position in June). So given the portfolio’s starting value of £71,358, the portfolio gained 14.3% and JD contributed 3.6 of those percentage points. That means JD produced about 25% of the year’s gains. So without JD (or with JD staying flat through the year) the portfolio would have gained 10.7%, which is still a decent return and hopefully evidence that the portfolio wasn’t overly reliant on a single stand-out stock. On the flip side, the biggest detractor was probably BHP Billiton. It’s down 45% year to date, and had a position size of 2.5% at the start of the year, so it cost the portfolio about 1.1% over the year, which is a level of single-company risk I can live with. You never know, I may set up a spreadsheet to do a more detailed attribution analysis in future, so thanks for the idea. 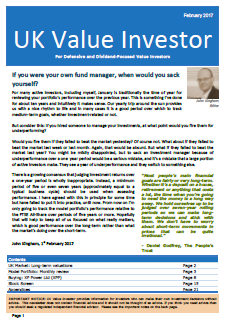 On a rough calculation I did better than UKVI on my UK portfolio but worse on my US value portfolio which more closely mirrored the Validea Benjamin Graham Guru approach. My standout in the UK was Greggs which I kept longer than UKVI did. I have added a technical analysis tweak which enables me to hold on to winning stocks for longer and benefit from market over exuberance. Also did well on Hargreaves Lansdown. My big loser was Shell which fortunately is a small position for me having sold it down in 2014 along with half my Tesco position. Some smaller good investments helped too and one big loser Premier Farnell lost about 40%. Hi Andrew, Greggs is my nemesis; as soon as I sold it the damn thing shot up in value! That did make me think about adding a momentum filter, but I just don’t like the idea of momentum investing and it would make me nervous about holding overvalued stocks (as I think greggs might be now) just because they were going up. Anyway, good job with beating me and let’s hope for some more double digit gains next year. Hi. How do you think, what could be the reason, that your model portfolio has started to beat the market during the second half of 2013, not earlier? Mostly I would say it seems to be that the All-Share’s performance has dropped off since mid-2013 as its earnings are going down rather than up, while my model portfolio’s aggregate earnings are still going up, which is driving up the dividend and the overall value. I’m not doing quite as well as you, but I’m catching up! I have a very simple question. Backing into your numbers above I’m interested in exactly how you calculate yield. I have been simply dividing my dividend return for the year by the starting value of my investments, but applying this calculus to your numbers doesn’t get me your result. Are you using some mid-range value for the portfolio, or is it the year-end value and a bit of rounding of the yield? And is there a specific reason for using the year-end value, other than that it’s more conservative? So the actual yield paid out, relative to where the portfolio started 2015, was 4.5%, which is a pretty decent yield I think.